I am so thankful for the connections created via Instagram. It is the social media platform that has allowed me to befriend designers I have long admired and more importantly, I have been exposed to individuals with unique perspectives I would have never known without the platform. One of the individuals I am thankful for finding is Annika Zetterman, (instagram) a Landscape based out of Sweden. 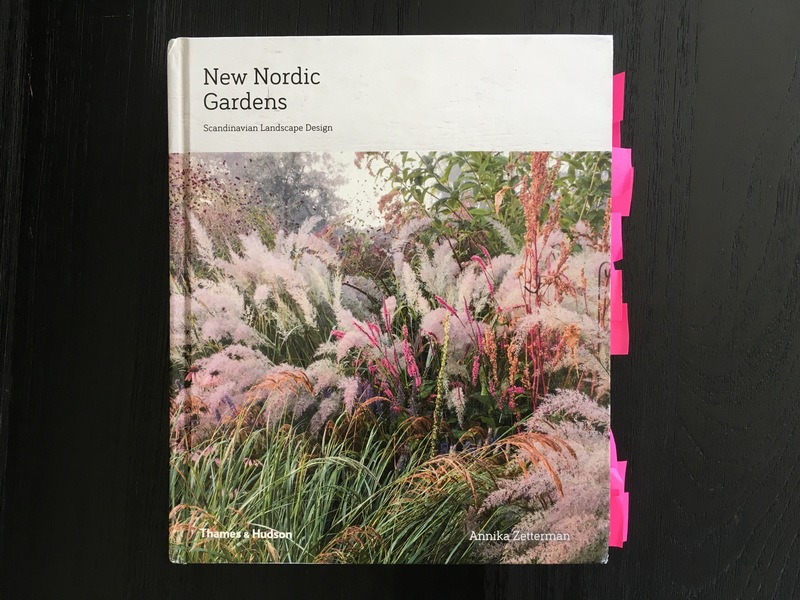 Thanks to Instagram, I was given a heads up about her new book, New Nordic Gardens: Scandinavian Landscape Design. I am so thankful for her book since books on Scandinavian garden design are often not translated in English and are very difficult to get copies stateside. This combination makes learning about Nordic designers very difficult, but Annika is the liberator to us nordophiles. 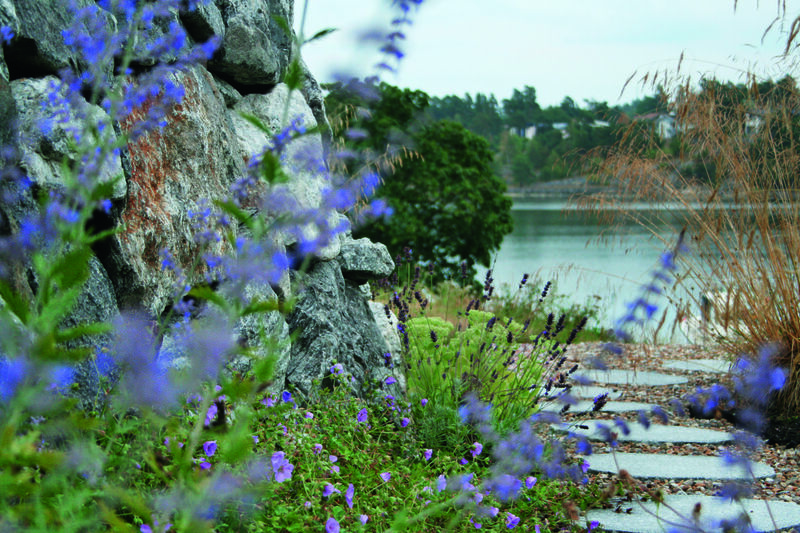 Photo Credit © Annika Zetterman From New Nordic Gardens: Scandinavian Landscape Design by Annika Zetterman. Scandinavian Garden design reflects the simplicity, quality and sustainability notability seen in the interior, product and fashion designs of the region. Materials are selected for long-term durability and connection to nature. Gardens are designed to be experiences from within, not just viewed from in doors or for the neighbors benefit. The New Nordic Gardens explains these innate Nordic principals while showcasing a vast collection of innovative applications that are all fresh and new projects that I have not seen before. You can see from my copy of the book in the intro image I have already marked dozens of pages for future reference. Later this week I will have interview from Annika with all her favorite items. The book releases April 11, TODAY (well yesterday, technical difficulties yesterday)! (order on Amazon HERE). 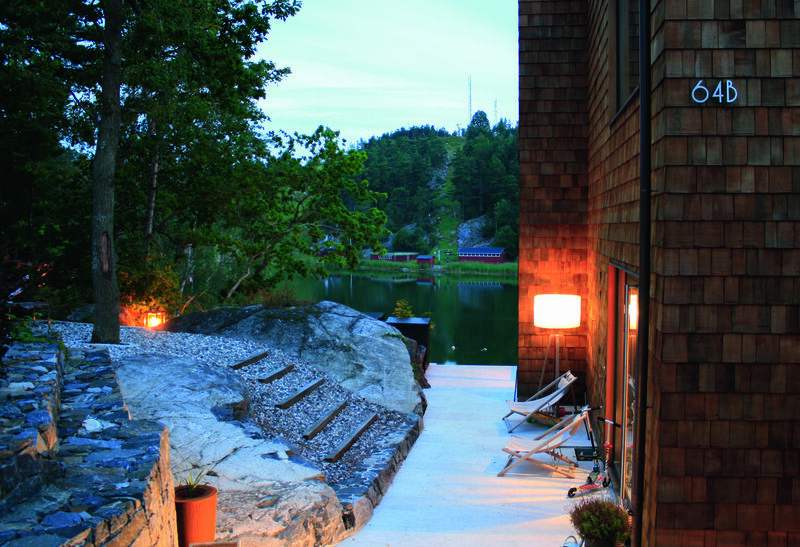 Here are a few image excerpts from the book, but I would highly recommend it to any designer or gardener looking to learn about a true Nordic perspective in garden design. The light at noon is the most balanced light, appearing nearly white, while light in the early morning or afternoon can provide an array of color variations. Natural light changes frequently, and so gardens also change in their colors, often appearing extremely subtle in the characteristic low light of Scandinavia. This garden by Zetterman Garden Design, situated close to a bay in Värmdö, Stockholm, is enchantingly calm on a still day dominated by a beautiful, weak light. On late summer evenings we might finish the day with a swim. When adding water to a garden, with swimming pools and larger bodies of water in particular, consider how they will blend with the rest of the garden and the wider surroundings. Swimming pools are large and relatively solid in color, so choosing a tile, stone or liner that includes colors close to natural water bodies in the region will help the pool to blend in comfortably. 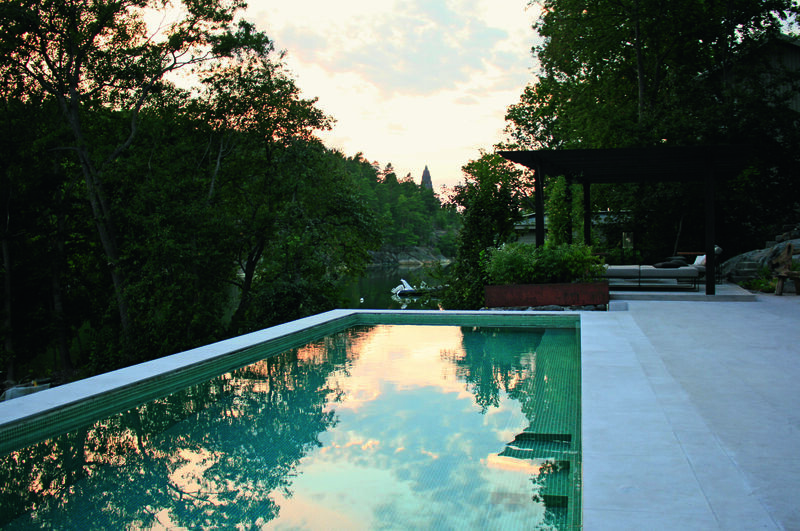 This pool by Zetterman Garden Design in collaboration with Per Oberg Arkitekter in Saltsjöbaden, Sweden uses a mosaic containing greens and turquoises, conveying a feeling of tranquility and sophistication, and rests peacefully in the space. In summer Scandinavians like to do everything outside. We hang out laundry, move our indoor plants outside, chill in hammocks and share meals. Outdoor kitchens, built-in barbecues, pizza ovens, fish smokers and other cooking facilities are increasingly a normal part of our gardens. This black beauty in a garden by Zetterman Ggarden Design in Saltsjöbaden, Sweden is made from Danish brick, fired to withstand the cold winters, with its chimney standing tall like a sculpture perched on a cliff. 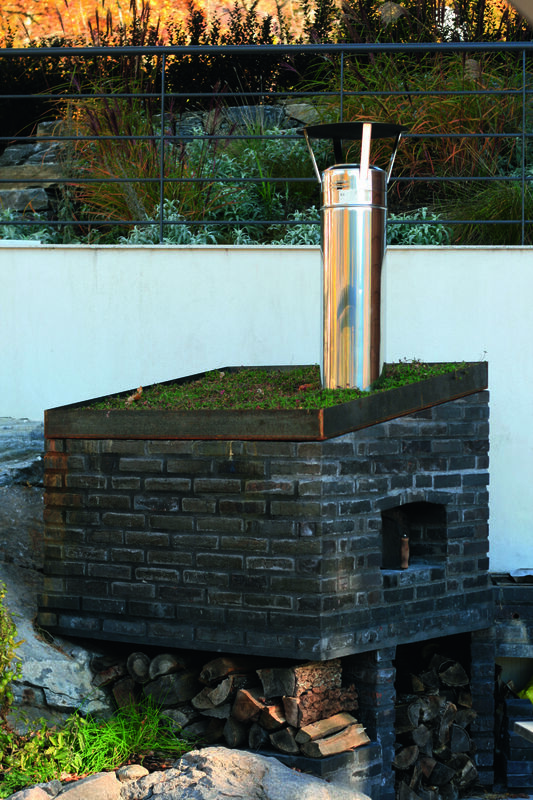 A sloping sedum roof gives character to the oven, matching the small herb garden that sits in a pocket of the rock just below. This entry was posted in Design Masters, G A R D E N S, Gardens, Greenroofs, Uncategorized and tagged Garden Books by Nick. Bookmark the permalink.